Noodler’s 54th Massachusetts blue-black ink has become one of my favorites. It is conservative enough to be useful in any situation -- business or personal -- but is still a lovely diversion from a standard blue or black. It flows easily -- it is wet, smooth, and easy to write with. It dries in a reasonable amount of time, and I find the color pleasant and easy to read. It also appears to have a touch of chartreuse to it that blue and black inks don’t typically possess. It’s highly saturated with low amounts of shading, even in a broad calligraphy pen. In a fine nib, it sometimes exhibits a slightly chalky appearance. It’s also worth pointing out that it smells strongly of solvents. If you are particularly sensitive to odors, you may want to avoid it for that reason, but it has never bothered me. My complaints, such as they are, are twofold: first, it does not behave in an outstanding fashion on cheap, absorbent paper -- though I typically have the luxury of writing on good paper. Second, it does create a noticeably bold line, due to its wet flow, which doesn’t work as well with my condensed style of writing. I have to write with a looser and larger style in order for my writing to be legible. It turns my EF nib into a M nib. However, it is otherwise such a joy to use that I put up with the inconvenience in order to use it. That says something about my appreciation for this ink. Dry time is relatively quick, though, as one would expect, it takes longer to dry on smooth, sized paper like Rhodia and Midori (20 seconds) than on cheap copier paper (1 second). It does bleed through and feather heavily on copier paper, but otherwise behaves. 54th Massachusetts is advertised as bulletproof - a marketing term that Noodler’s created to refer to ink that can’t be removed once it has bonded to the fibers in the paper -- so one would expect it to hold up on the water test, and it does. 54th Massachusetts soaks right in to the paper, which means that, on the smear test, where I run a wet finger across the page, absolutely no ink moved. On the drip test, where I place droplets of water on the page, absolutely no ink lifted off the page. Finally, on the soak test, in which I run the paper under the faucet, the ink stood resolute. Noodler’s 54th Massachusetts lives up to its bulletproof moniker - it's impossible to remove with water alone. Noodler’s 54th Massachusetts comes in a standard 3 oz. Noodler’s bottle that’s filled to the brim – so be careful when opening. Noodler’s intentionally uses stock bottles and lids to keep their prices low, which means that they aren’t intended to be show pieces in and of themselves. The labels, however, almost always tell their own story. Nathan Tardiff, the man behind Noodler’s, likes to create labels chock full of meaning. In this case, he chose an illustration of the ink’s namesake, the 54th Regiment Massachusetts Volunteer Infantry - the first African American regiment organized in the northern states during the Civil War. The regiment was organized in 1863 and, after training, was sent to South Carolina, where it took part in several famous battles, including the Second Battle of Fort Wagner. The label illustrates the regiment's frontal assault on the fort - a charge that became one of the best known episodes of the war. It was the story of this regiment and their charge on Fort Wagner that was the subject of the film Glory. All that aside, Noodler’s 54th Massachusetts is one of the best blue-black inks I’ve used. It’s a great value for the money, behaves generally well, and is easy to read. I highly recommend it. It’s an immutable karmic law that, when an ink producer creates a new color specifically to mock a presidential candidate, one then must use said ink to write the candidate’s campaign slogan, regardless of how one actually feels about said candidate. In this case, Nathan Tardiff, the man behind the curtain of Noodler’s Ink, created Berning Red in honor of Bernie Sanders, the democratic socialist senator from Vermont, and one of the two remaining candidates for the Democratic nomination. The tagline for the ink is “a red for lefties that dries fast.” Because Sanders is a socialist, he’s a lefty on the American political spectrum, and left-handed writers need a quick drying ink - get it? Also red, because red is equated with socialism, as evidenced by the Soviet-propogada-inspired label. Politics aside, Berning Red is quite a good ink. It’s a bright, candy-apple red - it doesn’t lean purple or brown, and no magenta is in sight. It’s a quintessential red that’s easy to read on the page. It has a moderate level of saturation, fading a little in the really broad strokes of a calligraphy pen, but producing a crisp, bold line with low levels of shading when used with a fine nib. It’s easy to write with, having a moderate level of flow and producing no sensation of scratchiness on most paper. After I was done testing it, it cleaned up easily, flushing quickly from the converter and feed. It did not stain. Berning Red is also an extremely cost-effective ink. Noodler's standard line of ink is the best value on the market - the 3 oz bottles run roughly $12.50, which works out to a cost of $0.14 per milliliter - the lowest of any ink I’m aware of. So how does the quick-drying claim stand up? Well, it dries faster than a lot of Noodler’s ink, though not so quickly as I’d have imagined for an ink specifically designed to be fast-drying. Overall, it was dry to the touch and smudge free in less than 15 seconds, with cheap office-grade copier paper being the fastest and Midori MD paper the slowest of those I tested. It is generally well-behaved across each of the paper types I tested, though it has an increased tendency to show-though on absorbent papers, and to bleed through when used with a really wet nib, like the Pilot Parallel pens. It’s not something you’re likely to encounter if you’re using good quality paper in a fine-nib pen, but it is something to keep in mind. Berning Red held up surprisingly well in the water resistance test, in which I simulate three scenarios: something wet gets dragged across the page, droplets of water fall onto the page and get blotted up, and the paper gets soaked. It smeared easily enough when I ran a wet finger across the page, which resulted in a lovely red smudge - so it is not suitable for painting over with washes or watercolors. However, it didn't completely lift from the page when I blotted it, nor when I soaked it under the faucet, which means that your work won’t be completely obliterated if you do happen to get it wet by accident. Noodler’s 3 oz glass bottles are, in and of themselves, utilitarian. They’re stock bottles ordered in bulk in order to keep the cost of production down. It’s the labels that are always interesting, even if they occasionally make you shake your head in bewilderment. Berning Red is certainly one of those cases. The Soviet-style design with hammer and sickle, and Bernie Sanders’ smiling face plastered on it is…fascinating. One cannot deny that it is eye catching. Whether you display the bottle proudly on top of your desk or stuff it in a drawer is likely to be driven more by your politics and sense of irony than by your aesthetic sensibilities. Berning Red is a great ink. I’m very happy with having had the chance to test it. While it doesn’t displace Diamine Red Dragon as my current favorite red ink, its good behavior, ease of reading, and cost effectiveness make it a go-to choice when I’m in the mood for a vibrant red ink. This bottle of Noodler’s Ink Berning Red was graciously provided by Pen Boutique. As I mentioned in my review of Diamine Meadow, I am not a connoisseur of green ink. I had a grand total of three specimens (J. Herbin Vert Empire, J. Herbin Vert Olive, and Iroshizuku Shinryoku) sitting on my self until I picked up Meadow. Vert Empire and Shinryoku were too dour to be of interest to me, and Vert Olive is so vibrant as to be all but unusable. Additionally, green isn’t a color that tends to hold my interest, especially when compared to blue, red, and violet, but Meadow opened my eyes to the versatility of green ink. I mention this so that you know that I am neither damning with faint praise nor speaking from a position of scholarly authority when I say that Kaweco Palm Green is my favorite green ink after Diamine Meadow. It is a lovely forest green that has the best shading of any of the eight Kaweco colors, and which exhibits the excellent behavior characteristics of the line. Palm Green behaves admirably across all paper types, exhibiting low levels of feathering and a narrow, crisp line even on cheap paper. This comes at a cost of a fairly dry flow, but it is not so severe as to be off-putting. It dries quickly across the board. Kaweco Palm Green performed identically to all of the other Kaweco colors in the water resistance tests. It has little in the way of water resistance, turing into a green smudge on the smear test (where I run a wet finger across the page), easily lifting from the paper on the drip test (where I let several drops of water sit on the paper before blotting), and washing cleanly away on the incorrectly labeled soak test (where I run the page under a stream of water for half a minute). I wouldn’t recommend using it in any application that requires water-resistance, like addressing an envelope or signing a check. Kaweco ink comes in two forms: cartridges and 30ml glass bottles, which is the format I used during testing. The bottles themselves are pleasantly designed, and the labels accurately reflect the color of the ink inside them. I have no real complaints about the bottle, other than I had to tip it to the side slightly in order to create sufficient depth to fill my test pen properly. Of the eight ink colors, Palm Green isn’t quite my favorite - that honor belongs to Caramel Brown, which I haven’t reviewed yet - but it is the one that has gone back into my in rotation more often than any of the other colors since I did my initial testing five months ago. If you need a great green ink that behaves very well, and are willing to put up with a relatively dry flow as a tradeoff, then I would recommend Kaweco Palm Green. A bottle of Kaweco Palm Green was generously provided by the fine folks at Kaweco for review. I'm a big fan of red ink. Red is my favorite color - I'm drawn to its vibrancy and dynamism. If the color red has a drawback, though, it is the quality that makes it so interesting: the high degree of contrast that makes it stand out from the crowd. In nature, red is an attention getting color, sending one of a number of messages depending on the organism in question: I am poisonous, I am ripe, I am dangerous, I am delicious. Unfortunately, all the extra stimulation that our brains must endure when dealing with the color can cause red ink to be fatiguing to read over a long period of time. To find a regular spot in my ink rotation, then, a red ink's aesthetic qualities have to outweigh the burden of use. Some colors capture my imagination: Diamine Red Dragon is magical and J. Herbin Rouge Hematite is spectacular while Iroshizuki Momiji is sublime. Kaweco Ruby Red, though, is more prosaic: it's a pragmatic magenta red, and it makes no pretense about being more. It exhibits low to moderate levels of shading, depending on the width of the nib, and provides very high levels of contrast on white, off white, and cream colored paper. As with the rest of the Kaweco line, Ruby Red is a dry ink that behaves well across all paper types, from the super-smooth Midori MD to the cheap, feather-prone, low-grade copier paper found in most offices. In the water test, Ruby Red showed no resistance at all. The smear test, in which I rub a wet finger across the page, resulted in a red smear that then lifted completely from the page when blotted. The drip test exhibited the same behavior: the ink lifted easily after a drop of water sat for a few seconds. The soak test, in which I run the paper under water, washed away the ink completely. Each of the Kaweco colors behaves similarly with regard to water resistance: they have none. As long as you keep this in mind, it shouldn't dissuade you from using the ink - just make sure to limit your use to applications that don't require it. Ruby Red is a fine red ink - it's well behaved and moderately priced - but it fails to capture my imagination. I don't think it will find its way into my regular rotation for that reason. 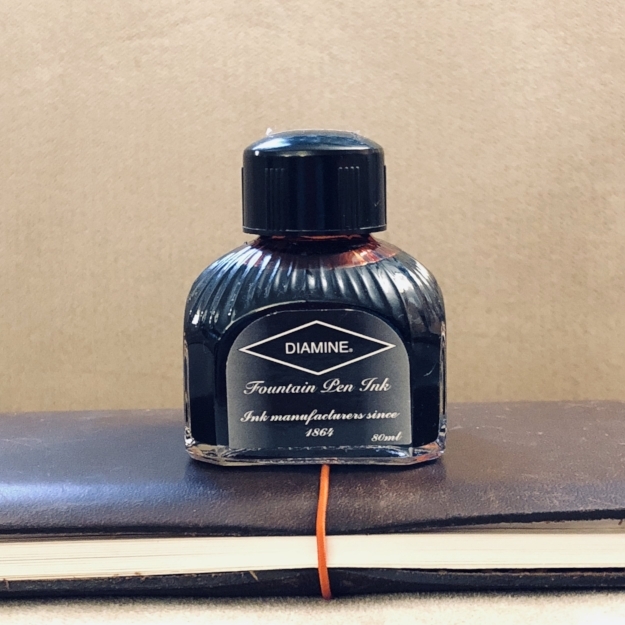 However, if you are in a position where you need a vibrant ink and you are stuck working with low-grade paper, it could be a very reasonable choice. A bottle of this ink was generously provided by Kaweco for review purposes.